With more than $139 million in transportation projects happening in the next 10 years, the DOT needs to hear your needs. The La Crosse Area Chamber of Commerce united more than 80 business leaders at an informational and feedback session with the Wisconsin Department of Transportation (DOT) and the City of La Crosse. The DOT explained the data they have collected to date, information they are still gathering and the process of creating strategy packages that will be presented in the next few months. Attendees had diverse questions about roundabouts. They expressed the desire to see the strategy packages moving forward and the need to address workforce traffic coming from the tri-state area. 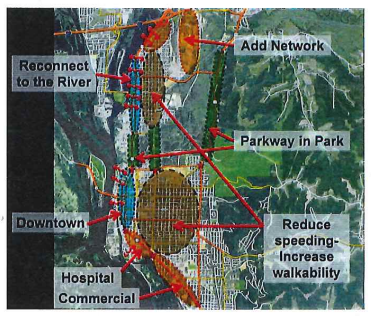 The City of La Crosse provided a double-sided handout on their transportation vision with the explanation that this is conceptual and will be used to evaluate future transportation projects on how they match this vision. There was concern expressed by attendees about the Toole Design Group’s approach to the charrette process that led to the Vision. One speaker pointed out that the 1998 referendum vote was on the City funding a portion of the project, not on whether or not a road should be built. It was expressed that we may need to solicit our legislators on what other silos of money may be available to address some of the transportation alternatives if we have solutions that are close to matching some of the existing silo’s criteria. One takeaway from the meeting was that there is a rift between citizens and businesses that is causing business representatives to not feel comfortable attending public meetings. We need to build bridges between these groups in order to find solutions. It was also apparent that this is still too conceptual for business representives to provide tangible feedback and that one-on-one conversations will be needed to collect data on freight needs, future needs, etc. The Chamber is collecting information via the survey link below that is being distributed to all Chamber members. The Chamber will also distribute an online survey to assist the DOT in gathering more specific freight, customers, employment, etc. information. Based on this, the Chamber is not in a position to form a statement on feedback from businesses. NEW: Businesses, Provide your Tranportation Needs to the DOT.